بني في 1883, فندق ويندسور هو ميزة مُضافة لـ ملبورن و خيار ذكي للمسافرين. يقع مركز المدينة على بعد 1 km فقط. ويمكن الوصول إلى المطار خلال 30 دقيقة. سوف يعشق النزلاء موقع هذا الفندق، فهو قريب من أهم المعالم السياحية في المدينة كمثل ‪Parliament Gardens‬, ‪Parliament House of Victoria‬, البرلمان . إن فندق ويندسور حريص على توفير الراحة للنزلاء، فلا يوفر الموظفون جهداً في تقديم أفضل الخدمات وضمان حسن الاستقبال. يمكن لضيوف الفندق الاستمتاع بالميزات التالية على أرض الفندق: خدمة الغرف على مدار الساعة, واي فاي مجاني في جميع الغرف, مرافق مخصصة لذوي الاحتياجات الخاصة, واي فاي في المناطق العامة, خدمة صف السيارات . يمكن للنزلاء الاختيار من ضمن مجموعة من الغرف المصممة بعناية لتعكس جواً من الراحة، والتي يتجاوز عددها 180. يقدم الفندق العديد من الفرص للاستجمام كمثل مركز للياقة البدنية, تدليك. إن فندق ويندسور هو مكان مثالي للمسافرين الذين يتطلعون إلى الراحة والاستجمام في ملبورن. تتوفر خدمة صف السيارات لقاء رسم إضافي بقيمة 55 دولارًا أمريكيًا. The staff was really nice and the hotel has its own unique charm from the past. Location is also great with a beautiful park to relax and shopping areas nearby. I enjoyed taking the free tram. Really enjoyable. The hotel was nice, reception extremely helpful. The breakfast was over rated, extremely limited in choice and poor value. Room service limited option. . At breakfast, if you wanted eggs, poached or scramble egg were the options. This hotel building is very old, but it is very classic. My husband likes it so much. We went there on our 1st anniversary and they upgraded me to a bigger room with a complimentary drinks and anniversary wishes card hand written from the staff that was on duty. The staff are warmly welcomed us and very friendly. I was pregnant when I was there, and they accommodate me with variety choices of pillow that suited my condition at that time. 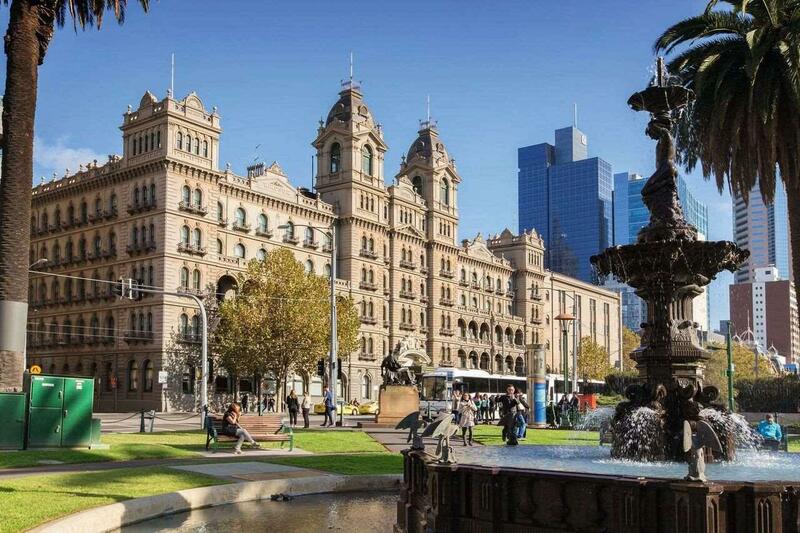 The location also nearby to a tram station which make it easier to travelling around the CBD. If you are a shopping-kind of person,this hotel is nearby to Collin Street where you can find all the luxury brand located along the street. Will come here again in future. Room was very basic although clean and location is convenient. The bed was comfortable and a pillow library was offered. The room was a bit noisy from the pub over the road. Not the room we were expecting view of a dirty alley way considering we were staying 6 night. We asked for room with a view but very helpful to try to get one for us it seemed too hard!! Stayed here for one night during the Melbourne Marathon festival. Close swanston st and very close to the MCG which meant I didn't have to walk far in the early morning. I requested a later check out and 12pm was offered for no additional fee - thanks! Stayed here for 2 nights. Staff friendly & helpful. Bed was comfortable with amenities such as mini bar; room service; toiletries. Location is great being central in a nice part of the city, Would stay again. Good services throughout. Concierge service was excellent. Thoroughly enjoyed our stay. Would definitely stay there again..
Beautiful hotel with so much history. Staff is helpful, polite, and cheerful. Also, walking distance to many great restaurants. it's was okay~ but if I visit Melbourne again I would probably choose the hotel nearer to downtown area and recently built. Pros- good location, clean, friendly staff, comfortable bed Cons - century old hotel (since 1883) with outdated and worn out furniture, unpleasant smell in the lobby, uneven floors, small rooms for the high price. Our first room was last renovated in the 60s, and the second room has barely been touched since the 1800s. Make sure to check traveler photos. The interiors were very different from what we expected based on the hotel’s featured photos. Thank you for the room upgrade and the birthday cake and all the wishes we really surprised and touched by your hospitality. We extend our stayed because our flight at the night time, we booked traditional room because it’s only for few hours but your were so generous to let us stay on the same room without any charges. That was really appreciated. Your staffs at checkin and checkout counter and also the staffs in conceirge really attentive and full of knowledge and also sincere. We really enjoy our stay there very close to Train & tram station. Walking distance to many attraction place, so many restaurant nearby and cinema also nearby everything was excellent and very convenient. We never felt annoying with the cracking sound from the floor and the ages that show on the building because we really love the history of the building itself. We definitely will come and stay at The Hotel Windsor again. This is the most beautiful vintage hotell!! Lovely buffet breakfast and there were many restaurants around the area that has great food!! Close to public transportation!! Next time, I need to plan to have the High Tea!! The hotel is very conveniently located near tram stations. Its interior is beautiful, very English Victorian. I love the paintings which adorn the walls everywhere. The staff is courteous and very helpful. I have a great stay in the hotel for 3 nights. Mason helped me a lots, he explained the rooms very details and let us have a short tour between the room we selected and his suggestion for upgrading the room. The upgraded room is definitely more excellent than my original booking, I have a great time in the Windsor hotel, and highly suggest to my friends. On arrival being greeted by the concierge, checking in, our luggage delivered to our wonderful room. It was stepping back 100yrs, the décor of this wonderful hotel is as it would have been back then. Service from the staff is faultless, A great place to stay in an ideal position in Melbourne. The friendliness and helpfulness of staff at front desk and concierge.